Capturing the wind and light in the sail. Brand new Workshop! 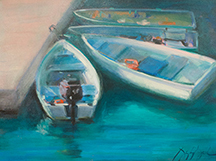 This exciting and fun class will cover the basic principles of oil painting specifically with regard to painting boats. 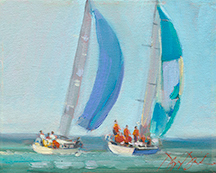 After the basics are covered, we will start by painting some basic boats and move up to more complicated groupings of dinghies and sailboats throughout the next couple of days. For those who have studied with Douglas before, this overview of principles is always a good review, and no matter what the subject, these principles are key, and new discussions and tips are added each season. Each day’s demo will include simple discussions on composition, massing, building form, light and shadow, near and far, capturing and developing atmospheric distance, and depending on your own style, knowing when a work is finished (learning how to not overwork your painting). Students will work in their own style/technique so that the finished work is their own. Douglas will overview his palette and concepts his work entails. 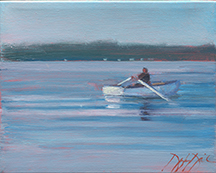 After a brief morning intro and adequate time to mix and set up the palette, Douglas will demo a simple boat and let the class follow along. Much time will be allowed for individual discussion and review in a systematic rotation. 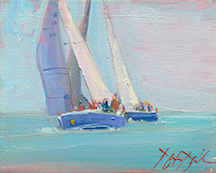 Various boats will be painted over the 2 day workshop and some incredible paintings will be accomplished. Depending on the skill level of each student, students are able to grow and develop at a rate that is to their comfort. Demos and individual discussions/instruction will help each student to begin to reach the preliminary goals they are striving to meet. Plan to produce several paintings. Plan to bring notebook/sketchbook and enjoy some demos along with some great stories to help you remember these principles that are the foundation of Douglas’ teaching. Douglas David has painted his way across the country, capturing the beauty and spirit of the things he loves- tranquil country landscapes, sunrises and sunsets on his favorite beaches, a simple pitcher of spring lilacs or peonies, a lemon, lime or a slice of watermelon on a checked tablecloth. Paintings that reflect comfort, warmth meaning and simplicity: similar to everything important to him- his close knit family, life-long friendships, creatively fulfilling work and giving his best. A recipient of numerous regional and national awards and honors, Douglas’ teaching is a way of giving back and sharing some of his journey with those who choose to study with him. For more detailed information, visit www.douglasdavid.com. rounds- in above sizes if you prefer round over filberts. And anything else student needs to help them paint well and feel comfortable. Please prime all canvas with a thin coat of thinned down Cad Red light and Permalba white to make a pink or light red tone on canvas. (This can be done first thing in class if needed). Douglas has a “suitcase of supplies” he brings along, it includes some recommended books, and some supplies in case a few students need a few items that are forgotten. Douglas also will offer a “BASIC PAINT KIT” (while supplies last) which includes all the basic oils, brushes, palette knife, palette and canvas panels and medium for those who do not want to buy these supplies individually. You would need to bring some paper towels and rubber gloves. Price $150., while supplies last. Please reserve your kit when registering. 1st hour: Welcome/Overview of Class. 2nd hour: Discuss principles with demos to explain ideas and concepts. 3rd hour: Mix Palette (Strings of color/organize your palette). Afternoon: Demo in classroom on how to paint various boats. Paint boats in studio. Morning: Demo in classroom on how to paint various boats. Paint boats in studio. Afternoon: Paint boats in studio. Last hour: Group work from past 2 days and positive constructive critique with the focus on future and how to apply materials learned in workshop. © Copyright, 2009-2018, Douglas David Fine Art. All rights reserved.